U.S. stocks plunged on Monday in their worst day of Christmas Eve trading ever, as the S&P 500 entered a bear market. The Dow Jones Industrial Average dropped by 653 points Monday in volatile trading, falling below 22,000. 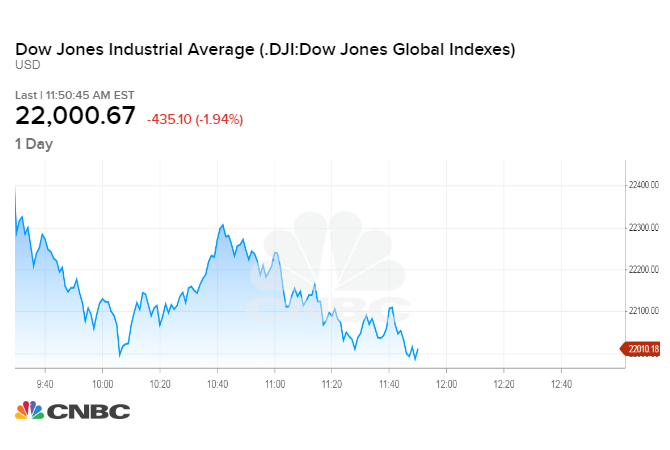 The Dow sank more than 2 percent, then recovered nearly all of the day’s losses, before again falling more than 2 percent. The S&P 500 fell 2.7 percent, slipping into a bear market, falling 20.06 percent from recent highs. Wall Street traditionally considers a drop of 20 percent or more from recent highs to be a bear market. The Nasdaq Composite Index slid 2.2 percent. Markets responded to turmoil in Washington. Multiple reports said President Donald Trump is discussing how to remove Jerome Powell from his position as chairman of the Federal Reserve. That discussion, as well as the recent market volatility, spurred Treasury Secretary Steven Mnuchin to call the leaders of the six largest U.S. banks over the weekend. Additionally, Defense Secretary James Mattis announced he would step down at the end of February, saying his views do not align with the president’s. Trump resumed his attack on the Fed on Monday, tweeting that the central bank is “the only problem” with the U.S. economy. “They don’t have a feel for the Market,” Trump said. All 11 sectors of the S&P 500 are now negative for December, the fourth quarter and the full year. Last week the Dow lost 1,655 points, or 6.8 percent. That was the Dow’s worst week of trading since October 2008 during the financial crisis. The S&P 500 also lost 7 percent for the week. The Nasdaq Composite is now 22 percent below its record reached in August and is in a bear market. “The key question is whether the market of stellar returns is going to a market of slow or stalling returns,” Quincy Krosby, chief market strategist at Prudential Financial, told CNBC. “This is a market selling off as if it believes that we are headed in to a stall. Exacerbating that is the thesis that the Federal Reserve’s policies are leading us to a hard landing, rather than a soft landing,” Krosby said. Last Wednesday, the Federal Reserve raised its benchmark interest rate for a fourth time this year and Chairman Jerome Powell signaled the central bank would continue to unwind its balance sheet at the current pace. The two monetary tightening actions are driving the stock market declines, traders say. There was a report late Friday that President Donald Trump was discussing the possibility of firing Powell, a move that could undermine confidence in the U.S. financial system. Other media outlets later confirmed those reports, but Mnuchin sought to from those reports this weekend. A senior Treasury official acknowledged that the reports about Trump’s discussion of firing Powell was part of the catalyst for Mnuchin’s call but not the sole reason. Mnuchin tweeted that he spoke with the president. Mnuchin declared that Trump said he never suggested firing Powell and doesn’t believe he has the right to do so. Mnuchin held calls on Sunday with the heads of the six largest U.S. banks in order to reassure nervous investors that the financial markets and economy were functioning properly. “The banks all confirmed ample liquidity is available for lending to consumer and business markets,” the statement from the Treasury said. “We continue to see strong economic growth in the U.S. economy with robust activity from consumers and business,” said Mnuchin added in the statement on Sunday. A senior Treasury official told CNBC on Monday that the purpose of Mnuchin’s call and statement was to take a “prudent, preemptive measure” after last week’s market volatility. Wall Street is processing Mnuchin’s call, which seems “to raise more questions than answers,” Raymond James analyst Ed Mills said in a note. Mills thinks it is unclear why the Treasury secretary hosted the call, “as no one had seemed to raise any concerns related to these issues of which Mnuchin is seeking to reassure the market,” Mills said. December is typically a buoyant month for stocks. Yet both the Dow and S&P 500 are down more than 12 percent this month — on track for their worst December performances since the Great Depression in 1931. Oppenheimer equity analyst John Stoltzfus said in a note Monday that “putting the recent equity market declines into historical context lessens their sting.” The three catalysts which pushed the market lower in 2015 and 2016 — China, the Federal Reserve, and oil — are roiling “the market yet again in 2018,” Stoltzfus said. “The markets are saying there’s a greater than 50 percent chance we enter a recession and fundamentals don’t support it and fundamentals win,” Zidle said. Also weighing on investor confidence is a government shutdown, that on through at least Thursday. Both the Dow and the S&P 500 are now in the red for 2018 by more than 10 percent. Some traders have suggested that the market has gotten to the point where a short-term bounce could occur, if only for technical reasons. Seasonally, this is usually a positive, or at least benign, time for the markets. The next worst Christmas Eve for the Dow and S&P 500 was in 1985, when both indexes fell a little over 0.6 percent. The NYSE closes early on Monday at 1 p.m. ET. The exchange is closed on Tuesday for Christmas day. Wednesday through Friday are normal trading days.